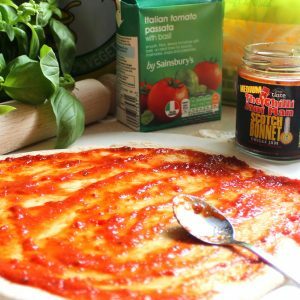 One of our favourite quick meals is homemade pizza with chilli jam passata – it really is as easy as adding a spoonful of your favourite chilli jam to your passata base! 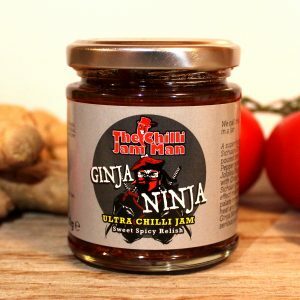 We love our Scotch Bonnet chilli jam for this, as it’s perfect for all things tomato based. 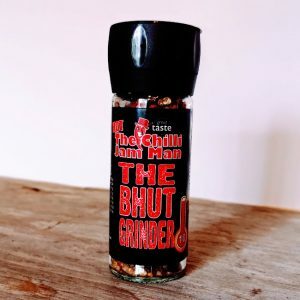 We also added a twist of our fantastic Bhut Grinder for good measure. For the base: 300g strong bread flour, 1 tsp instant yeast, 1 tsp sale, 1 tsp olive oil, 200ml warm water. To finish: basil leaves, drizzle of olive or chilli oil. Turn the oven onto full heat, or fire up your pizza oven. Put the flour in a bowl, add the instant yeast and salt. Make a well in the middle, add 200ml of warm water and the olive oil. 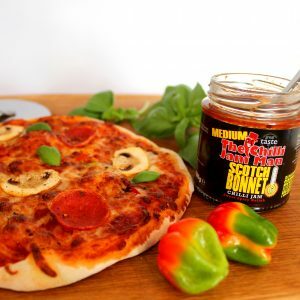 Mix with a wooden spoon and you’ll end up with a sticky soft dough. On a lightly floured surface, turn the dough out and knead it for a few minutes. Pull into two, and keep the other half covered with a tea towel. Roll the first half out – try and make it into a thin round base so it cooks through. Carefully lift the base onto a piece of lightly floured baking sheet. Add half the passata and chilli jam and smooth the sauce out to near the edges. Add the mozzarella, followed by your toppings. Transfer the baking sheet very carefully onto the hot tray and pop it on the top shelf of your oven. 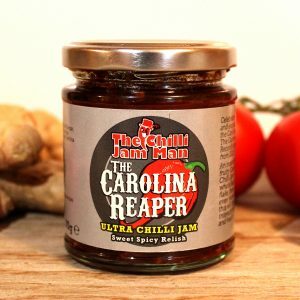 Keep a close eye on it – ours take around 7 minutes at 220 degrees. 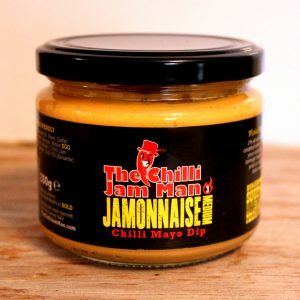 Add a drizzle of olive oil / chilli oil, a few basil leaves – and enjoy!